Following the course, we had a chance to use the techniques I had learned in a pitch to Deloitte. We decided to go nuclear in our ambition and we made the pitch all about them. We smashed it. We won a three-year partnership with Deloitte, worth £200k. Missenden Abbey in Buckinghamshire, 15-16 May 2019. There are partnerships – and then there are ground-breaking partnerships. This masterclass is an excellent opportunity for you and your organisation to step up your game and secure major, long-term corporate partnerships. Remarkable Partnerships are proud to present our Corporate Partnerships Masterclass enabling you to transform your ability to attract, secure and deliver truly exceptional corporate partnerships. How to shift your partnership focus from tactical to strategic. How to engage companies on their greater purpose. How to identify and communicate your value as a charity partner. How to identify your ideal corporate prospects, beyond the usual suspects. How successful partnerships are based on innovative ideas – and how to tell the good ideas from the bad. How to secure meetings with your target prospects. How to deliver an outstanding pitch. How to convert hot prospects into partners. How to inspire and involve your colleagues. How to avoid wasting your time. Your comprehensive roadmap for creating major, long-term, corporate partnerships. Your partnership proposition and focused prospect list, developed in cooperation with the experts. Awareness of the barriers that can hold you and your organisation back. Inspiration and confidence to win bigger and better partnerships. Ambitious corporate fundraising managers, executives and officers. The content of the Corporate Partnerships Masterclass is built on research-based insight and our extensive experience and wide range of case studies from UK, US and Australia. The masterclass is a mix of teaching, in-depth group work and individual sparring. Attending this exclusive masterclass will give you a results focused action plan to be implemented immediately on your return. 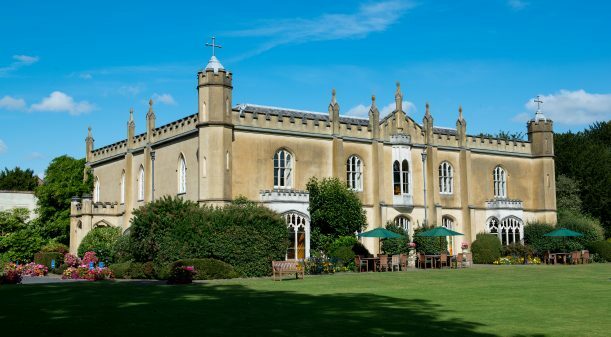 Missenden Abbey is an inspirational learning environment situated in the heart of the Buckinghamshire countryside. It is the perfect location to escape from your email and normal daily routine and allow you the space to focus and think clearly. It is also conveniently located, less than one hour’s train journey from central London (Marylebone station). Jonathan is a corporate and charity partnerships specialist with 19 years’ experience. He has led successful teams at Alzheimer’s Society, Age UK, Action for Children and Unilever. At Alzheimer’s Society his team increased fundraising income from £4m to £16m. He has secured major partnerships including BT, Bupa, Credit Suisse and Santander. He is the co-founder of Byte Night, which has raised over £8 million for Action for Children. He is the founder and managing director of Remarkable Partnerships, a consultancy helping companies and charities create partnerships of shared purpose and significant value. He has written two industry reports and he was corporate partnerships project leader for the Commission on the Donor Experience. Royston has over 25 years’ experience working for blue-chip, multinational companies, developing retail and commercial businesses and partnerships. He has successfully managing award winning sales and marketing teams both in the UK and Asia. He is passionate about the power of partnerships and he joined the charity sector in 2014, managing the new business and partnership activities at Bloodwise and Sue Ryder. Whilst at Sue Ryder he secured an innovative, long-term partnership with DHL and managed the Morrisons partnership during its final six months, raising over £1.25 million. Royston joined Remarkable Partnerships in 2017 to provide strategic and practical solutions to help charities grow their corporate partnerships. Helen has led award-winning global partnerships including Jaguar Land Rover and their sustainability partnership with the Born Free Foundation which has raised over £1 million. She has also secured and account-managed partnerships with Hewlett Packard Enterprise, Etihad Airlines, Wyevale Garden Centres and Lush. In addition, Helen has specialised in working with global travel companies in their charity-alignment and commitment to ABTA’s animal welfare guidelines. She holds a post-graduate diploma in Direct and Digital Marketing with London’s IDM, a degree in music and is a fully-trained radio presenter. The course fee includes all meals and one night’s accommodation on 15th May. The course starts at 10am on Wednesday 15th May and finishes at 4pm on Thursday 16th May.